The Chinese are now into the home straight heading for the first day of the Olympics on 080808. The question remains whether the pollution will have been cleaned up by that time. I read a fascinating feature on the New York Times today addressing this very problem. Having visited Beijing last November for seven days I know how bad the problem is. The day we went to the Summer Palace the pollution scale read 253. The World Health Organisation suggests anything over 20 is bad for your health. What was more shocking is that in the depths of winter the scale has exceeded 500. The image of the Olympic Stadium was taken from the taxi on that ‘253’ day. 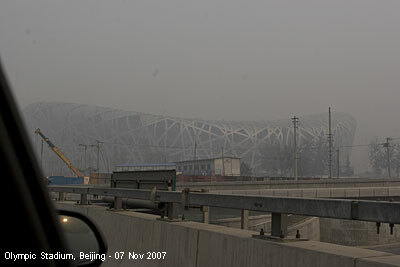 While I had trouble actually seeing the stadium through the smog the taxi driver was so proud of it he pulled over to the side of a busy three lane highway to let me take the picture. The government in China has promoted the concept of Blue Sky Days – they reached 165 such days in 2007 – trouble is their ‘blue sky’ only needs to be below 100 – which is still 8 times the WHO recommendation. And the majority of the ‘blue sky days’ fall between 95 and 100. Still, if any country can clean up their act for the Olympics then China is that country. They’ll probably do it by legislation, although they deny that they will have to resort to this.